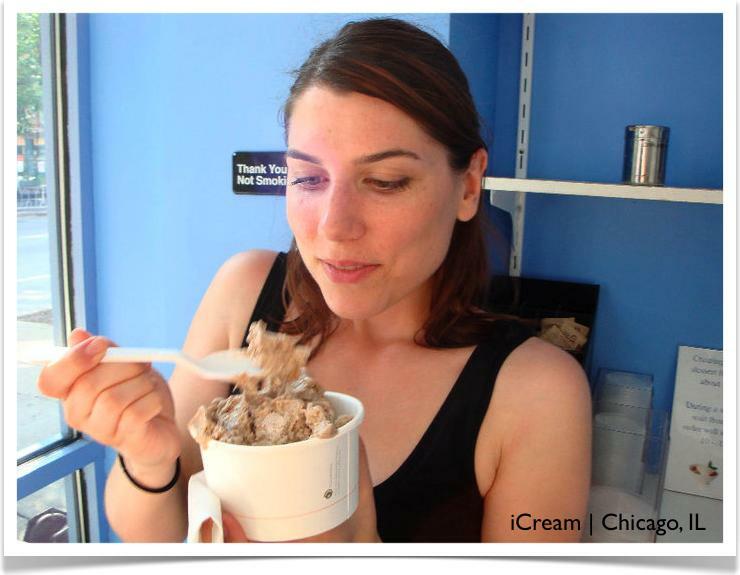 After attending Chef AJ’s cooking class (click here to read the post about it) we were hanging out at her house when she mentioned a vegan soft serve place nearby…my ears perked right up. Everyone starting raving about how amazing the vegan ice cream was and that it was made with sweet potatoes as a base. I was in like Flynn. 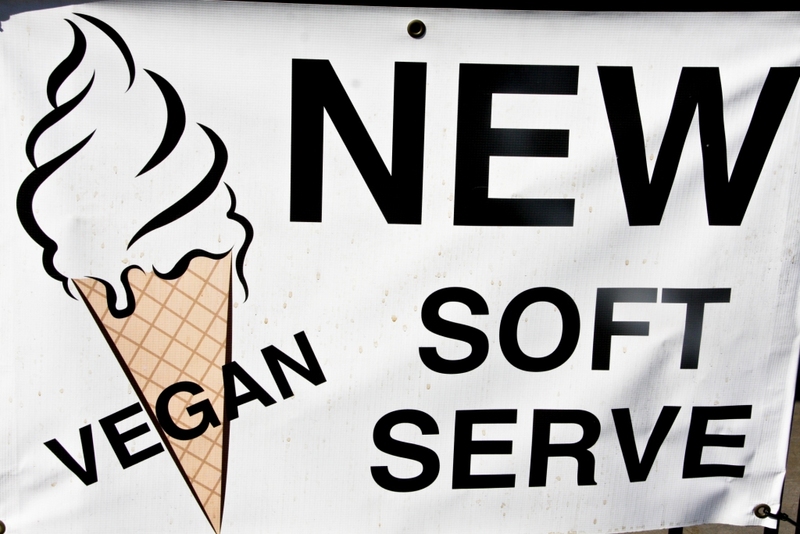 We headed over to Hugo’s to get some amazing soft serve vegan ice cream. 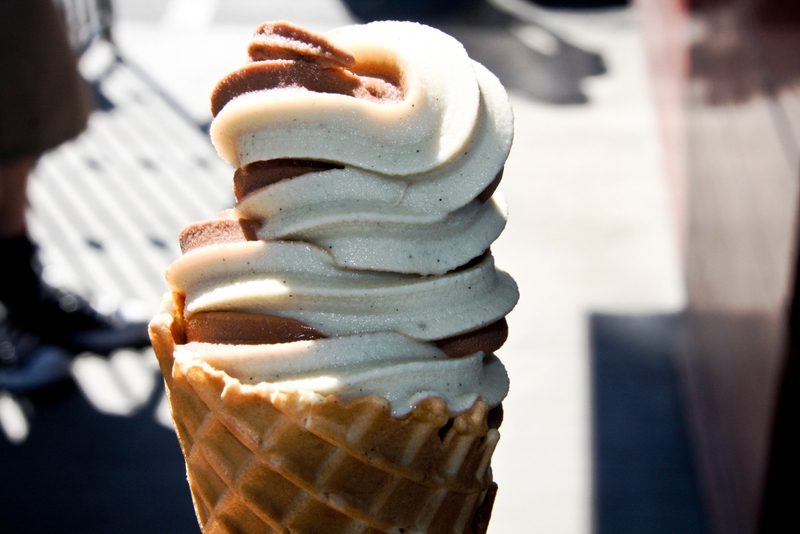 They serve chocolate, vanilla, or a swirl of the two (which I opted for). It was AMAZING and so creamy!!! I can’t wait to take my family next time I am up in the LA area with them. 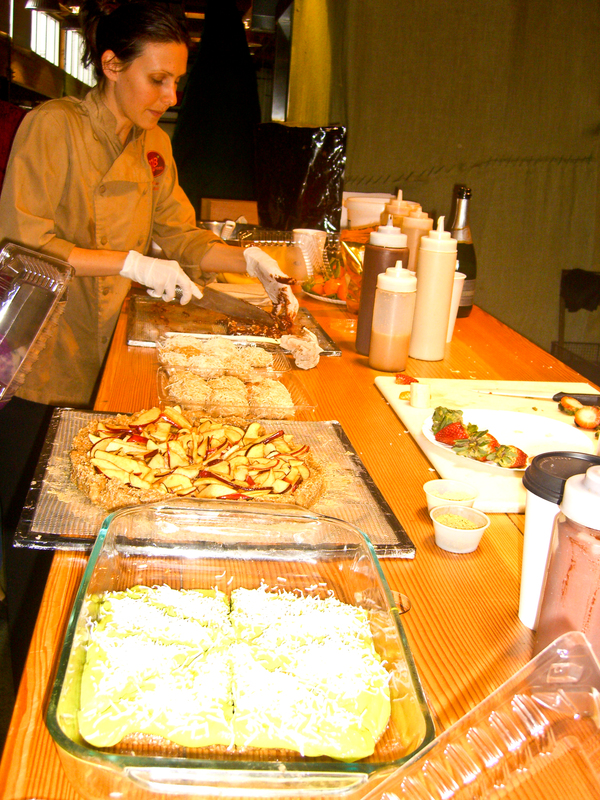 While we were there we ran into one of Chef AJ’s friends, Chef Rawsheed who is a celebrity raw chef and leader within the raw movement having founded Sun Power Natural Cafe. 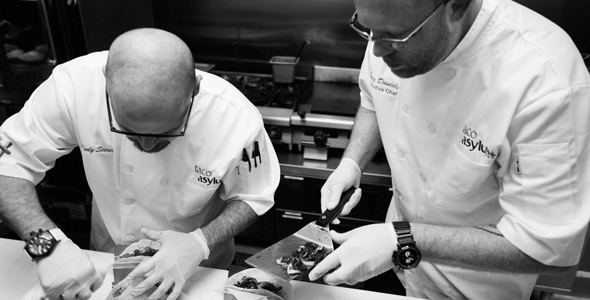 Chef Rawsheed is on the left in the picture below along with Nick whom I met at the class. 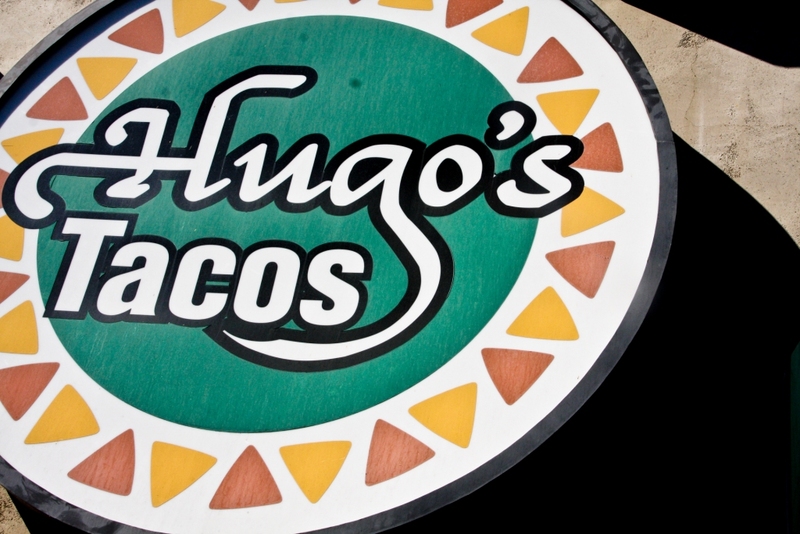 Hugo’s vegan ice cream stand is in Studio City at the 101 and Coldwater. While I haven’t eaten an actual meal at one of their restaurants (they have 3 locations), their menu looks great and is filled with lots of vegan and vegetarian options. I am going to have to have lunch AND ice cream next time I go. I also hear that there is a vegan ice cream parlor called Atomic Number 7 in Henderson Nevada, so you can bet we will check that out too the next time we are in Vegas. 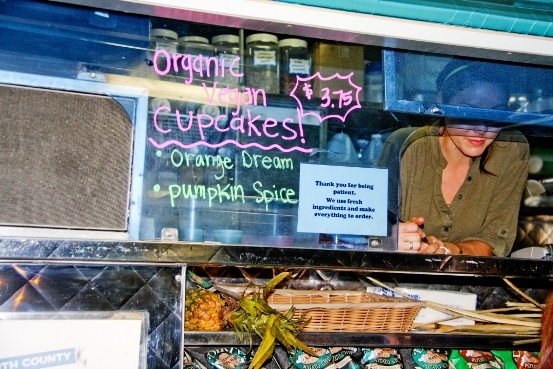 I first heard about Will Travel For Vegan Food through Chic Vegan, and I remember being awed by the creator’s vision. Basically, Kristen has plans to spend a year traveling the US while eating at all of the vegan restaurants in our great nation. What a great idea!!! I for one would love to take her out for a meal when she hits California. Please consider supporting Kristen on her amazing journey…click here to pledge. 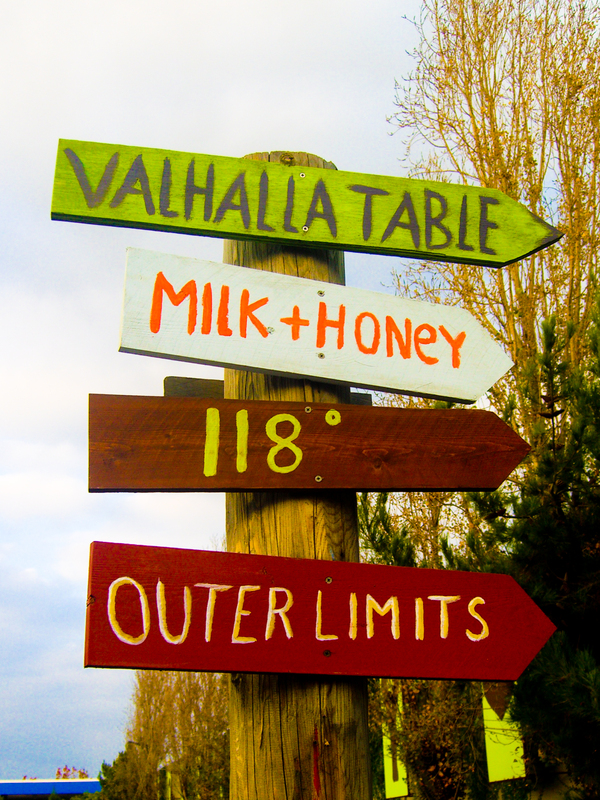 Have you ever had an idea that seems a little crazy, far-fetched but absolutely awesome? Did this idea keep you up at night and wake you early in the morning? You’d do almost anything to make this idea a reality but it seemed to be just out of reach…in SOME way? Well, I have one of those ideas. Some people tell me it’s crazy. But I think it’s undeniably awesome. 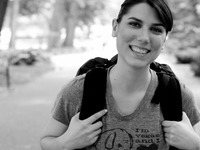 My name is Kristin I am a food and travel enthusiast. And when I say I love food I mean, really love food. I take pictures of it when I go out to eat and when I’m cooking at home. Anyway, I’ve spent a lot of time trying to figure out how to combine these two passions while also helping others. And I’ve finally found a way. A few months ago I decided that I’m going to celebrate 5 years of being vegan with a road trip. An EPIC road trip. I’m selling ALL of my crap and hittin’ the road for a 1 year long, food focused road trip across the country. 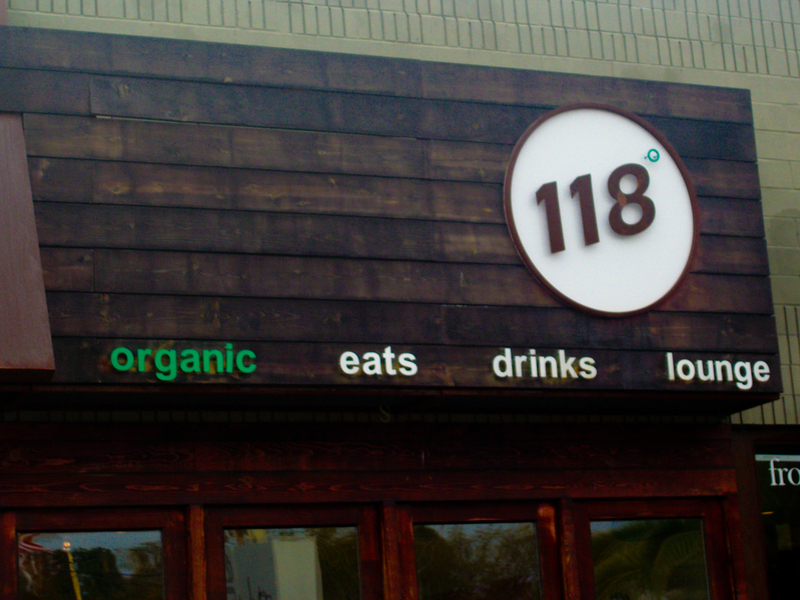 The plan is to attempt to eat at all of the 100% vegan restaurant in every major US city. I‘ll be writing and video blogging about the journey, every step of the way, writing food reviews, interviewing restaurant owners, other vegan business owners, and volunteering at farm sanctuaries and other animal rescues, as well. The goal is to help spread awareness about veganism and all of the amazing restaurants and other vegan businesses throughout the country. The journey is schedule to end on October 28th, 2012 – which is my 30th birthday – with an over the top charity party dedicated to raise money for an animal sanctuary. I’m hoping that my road trip will stir up enough attention so that by the end, we’ll have a big bash to celebrate veganism, the animals, the environment, and our health! But I need your help. In order to pursue this crazy dream I quit my full-time, 9-5. I’m still doing some freelance work but I’ve come to realize that this 365 day journey will require more funding so that I can safely make my way across the country. I’ve already heard from a few folks who’ve said that this a journey they’ve dreamed of taking. Well, if you’re one of those people, don’t hesitate… because, if you back my trip by donating through Kickstarter, I’ll happily take you along on the journey with me. Literally! And I’ve got a few other things in store for my backers, including home cooked meals, by yours truly; sponsorship listings my website, and more. If you know of others who might be interested in supporter this journey, please help spread the word by posting this project to Facebook and Twitter. “If you want it badly enough, and are willing to make some changes in your life to cause it to happen, you too can take over the world…or do anything else you really to do. The only things you’ll need to give up are assumptions, expectations, and the comfort zone that holds you back from greatness.” – Chris Guillebeau. I’ve set the goal at $9,682 because a few generous people have already made donations to the trip on their own, so I’ve subtracted those donations from the original goal. My husband and I have found a great taco joint that we both are really excited about. 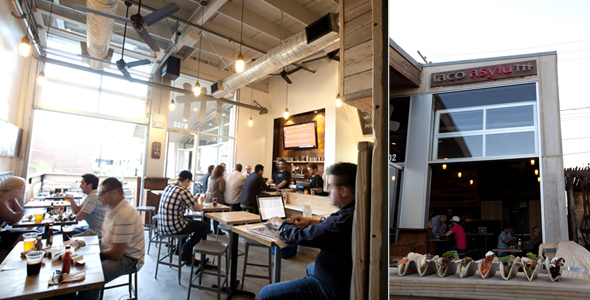 I first heard about Taco Asylum at The Camp in Costa Mesa (also where 118 Degrees is located) through AAA’s Westways Magazine. I have found so many of my favorite restaurants through this publication. Specializes in non-traditional gourmet tacos, Taco Asylum pulls from a wide array of global cuisines, showcasing interesting ingredients ranging from Mediterranean-style grilled octopus to East Indian-style curried paneer. Le Cordon Bleu trained Executive Chef Greg Daniels (from Haven Gastropub) has carefully thought out and uniquely constructed 9 taco offerings, each with a distinct flavor profile, ingredients, and accompaniments. Our own unique tortillas, marinades and sauces are made in-house and from-scratch, using only the freshest ingredients, sustainable meats and seafood, and products from local farms and vendors wherever possible. We decided to give Taco Asylum a try about a month ago and went back again this past weekend for some more awesome tacos. Taco Asylum currently offers only one vegan taco (and one vegetarian), but man it is good. 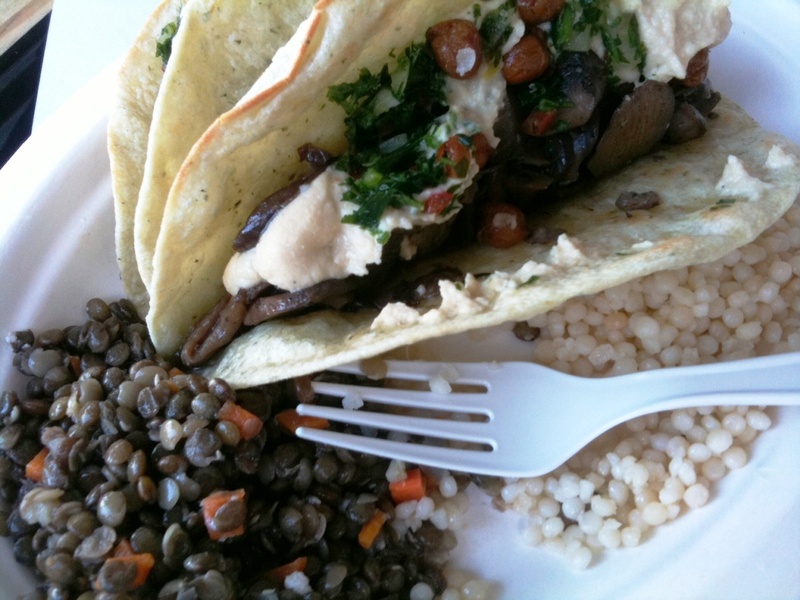 The vegan taco is a made with wild mushrooms, a chickpea puree, parsley salad, and topped with fried chickpeas. The first time we tried this restaurant they did not offer beans and rice, but they have since added it to the menu. I ordered two wild mushroom tacos with beans and rice and it was the perfect amount of food. I was pleasantly surprised when the plate came out and the beans (I asked for no cheese topping the beans) were lentils and they were so tasty. I would have liked to have the “rice” be rice, but it was Israeli couscous which tasted great, but I do prefer the whole-food benefits from rice (Israeli couscous is actually pasta). I am sure I will be going back many, many more times, but would love to see another vegan offering on the menu!!! VEGGIE GRILL – FREE ENTREE FOR VIRGINS! This Wednesday April 20th after 4pm bring in a friend who hasn’t been into Veggie Grill yet, let the cashier know, and they will comp the friend’s entree! This is Veggie Grill’s way of celebrating Earth Week. One Veggie Virgin per experiences Veggie Griller. No solo VG virgins. I feel like I hit the jackpot…let me explain. 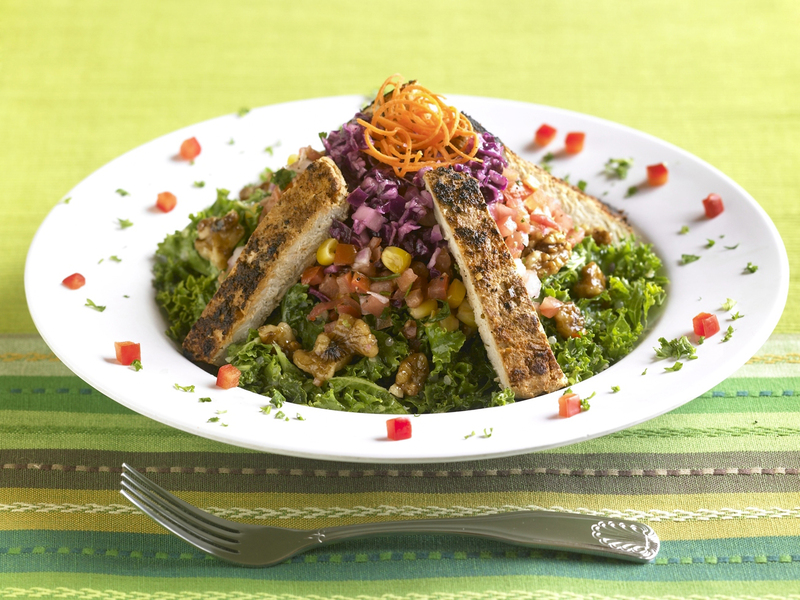 At the moment my favorite restaurant meal is the All Hail Kale salad at Veggie Grill with grilled (not blackened) tempeh. The other day I was craving it and thought, “Why not Google ‘All Hail Kale Veggie Grill Recipe? '” Well, what do you know…the recipe was on the web!!!!!! JACKPOT!!!! 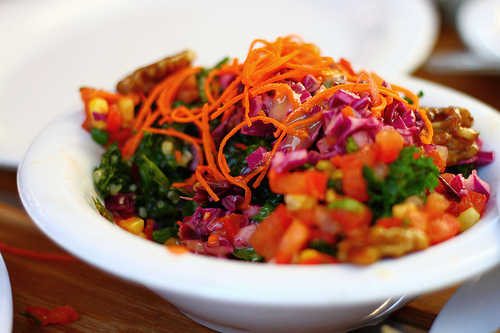 It looks like preparing this salad is a bit involved, so I will still buy it when I go to Veggie Grill, but I am so excited to make it for BBQs and parties this Spring and Summer. I myself had never done any research into the founders of Veggie Grill, so when I saw this post I decided to Google Ray White. I found a very interesting interview of Ray on Behind the Food. Who knew that Ray White and Tanya Petrovna started Native Foods together??? To read the interview click here. 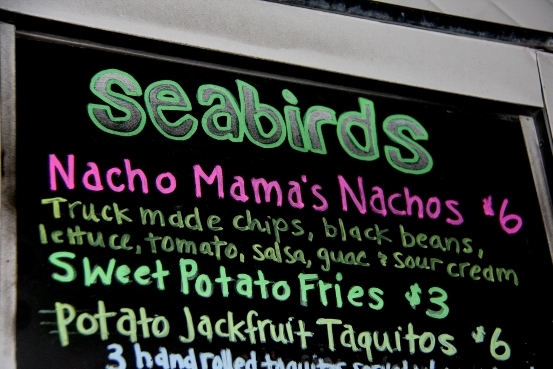 SEABIRDS – OC’s Vegan Food Truck! 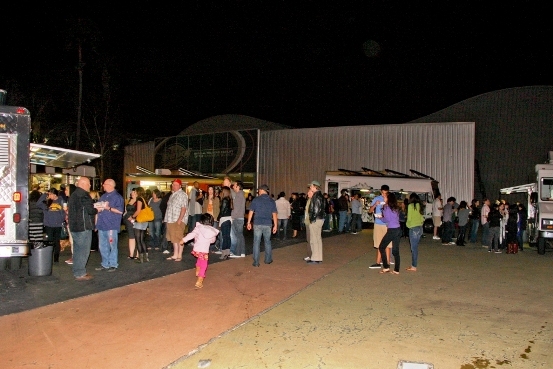 This Saturday we went on a family adventure (led by my hubby) to experience the new food truck craze. 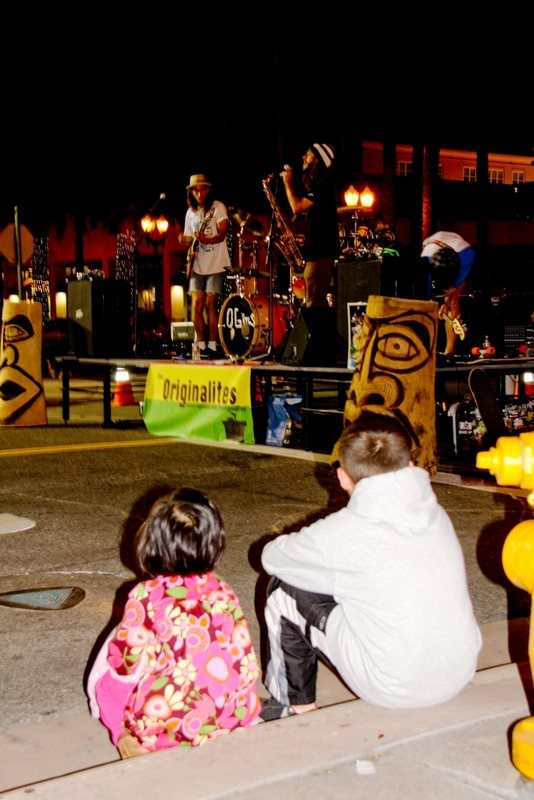 Downtown Anaheim was having an art walk and five food trucks came to provide the food. The trucks parked in the parking lot of the training facility for the Anaheim Ducks. My friend Anita clued me in to the fact that there is now a vegan food truck in our area (Seabirds) and since they were scheduled to be there I was excited to go and try them out. If Seabirds hadn’t been there my food choices would have been major slim-pickings! 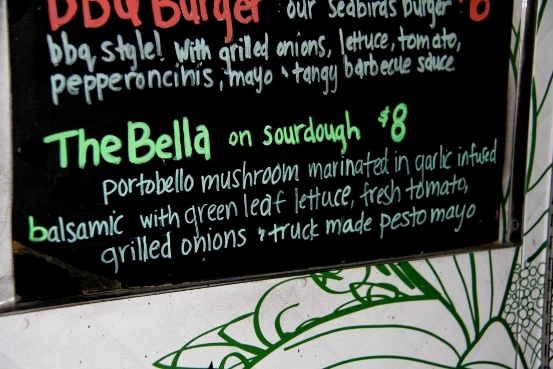 I opted for three menu items; the nachos, portobello sandwich, and a gluten free cookie for my little girl (she’s GFree). 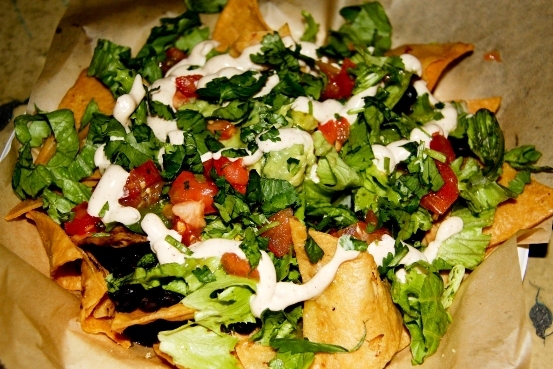 The nachos were very tasty and had just the right amount of spicey kick to them. My only criticism is that the chips were a tad too greasy. The sandwich was very flavorful. The marinated portobellos were on spot! My husband and son loved it too. 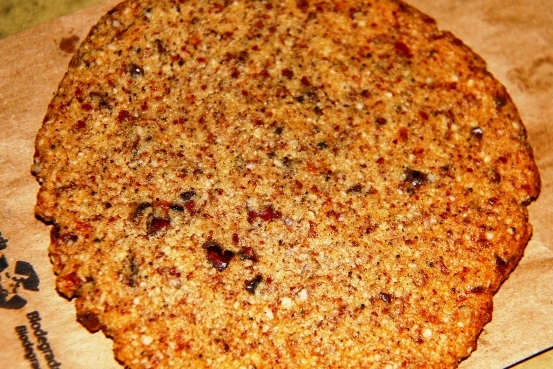 My daughter loved the cookie by Sweet Raya so much that when any of us got near it she literally started freaking out because she thought we were going to try to eat it. Too cute! I did sneak a bite ( a girl has to do her research, right?) and can tell you that it was really good…much better than it looks. All in all it was a really great night. The kids got to paint, watch other painters, and listen to bands. I definitely recommend trying the food truck craze. 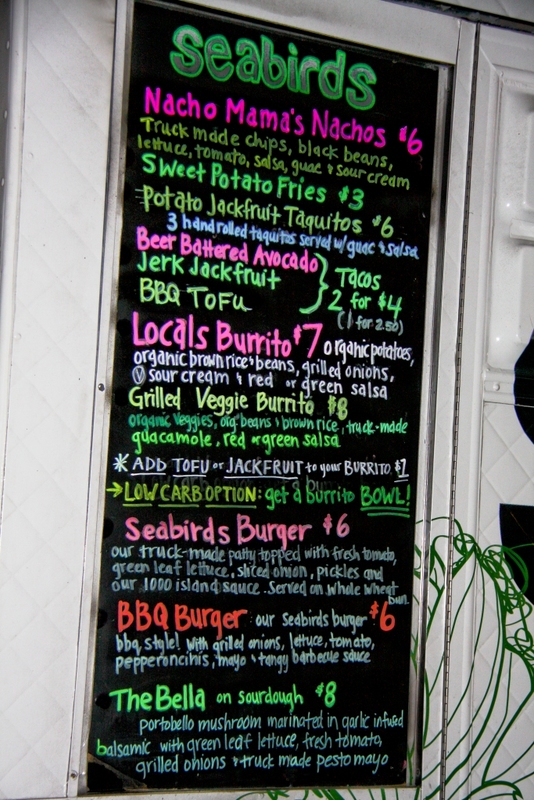 The next time I have the opportunity to eat at Seabirds I will be getting the grilled veggie burrito…I saw one of them and it looked really good!! Click on the links below to learn more about that trucks that were there last night. 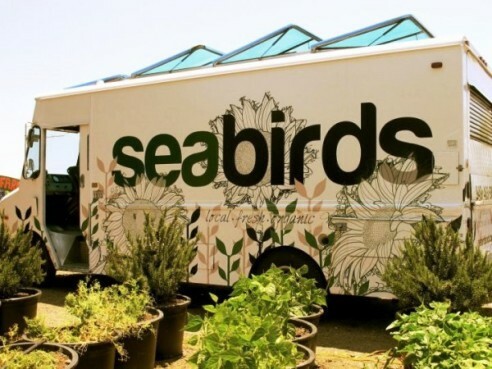 Have any of you tried Seabirds or another vegetarian food truck in your area? What is your favorite menu item? 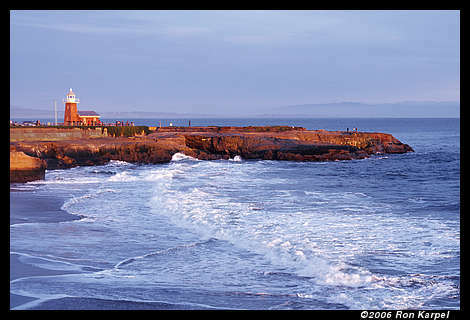 I am spending the weekend in a true health food Mecca, Santa Cruz, Ca…It doesn’t get much more earthy/crunchy than here!!! Which of course means that I am a happy lady. 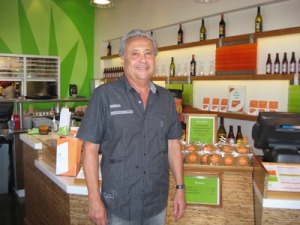 It seems as though there is a juice bar or health food store on every corner. 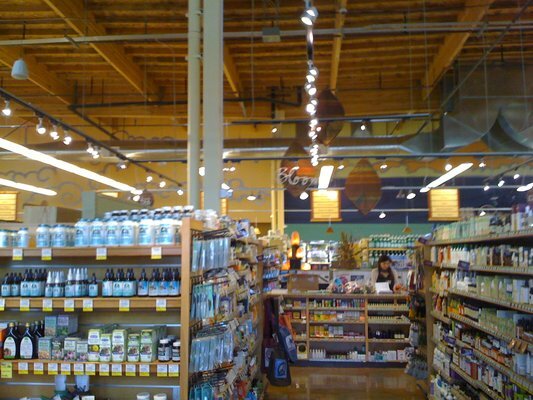 I would be in heaven if I could pack up all of the grocery stores they have here and bring them home with me. Two of my favorites are Staff of Life and New Leaf. My trip up here was motivated by the fact that Bauman College of Holistic Nutrition and Culinary Arts was holding an open house tonight and I wanted to learn more about their programs. Tonight I was able to spend some one on one time chatting with Ed Bauman, the Executive Director of Bauman College. 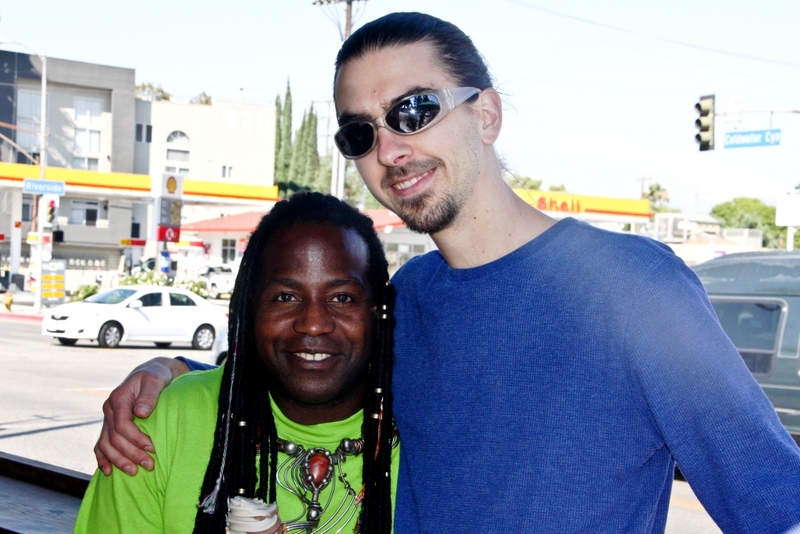 I always enjoy meeting like-minded people and learning something new from them. It was a very informative and interesting evening. 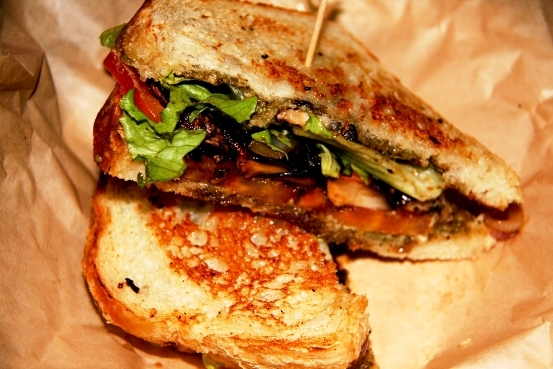 Layers of grilled eggplant, grilled tomato topped with a special seasoned lemon-garlic sauce and parsley. Spinach sauteed with onions topped with lemon-garlic sumac sauce. Mushrooms sauteed with onions in fresh lemon-mint sauce. Mix of parsley, tomato, green onion, fresh mint, lemon juice, burghul and olive oil. I hope all of you are enjoying your weekend as much as I am. Since it’s the weekend try to take the time to cook together…maybe even tackle a new recipe! To read more about Bauman College click here. 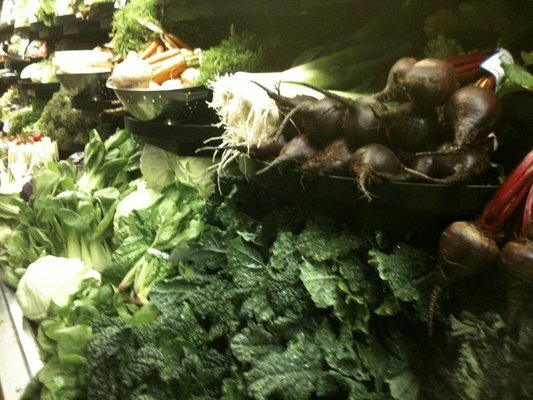 Today I went to a raw cooking class at Jenny Ross’s 118˚ in Costa Mesa and had a great time. 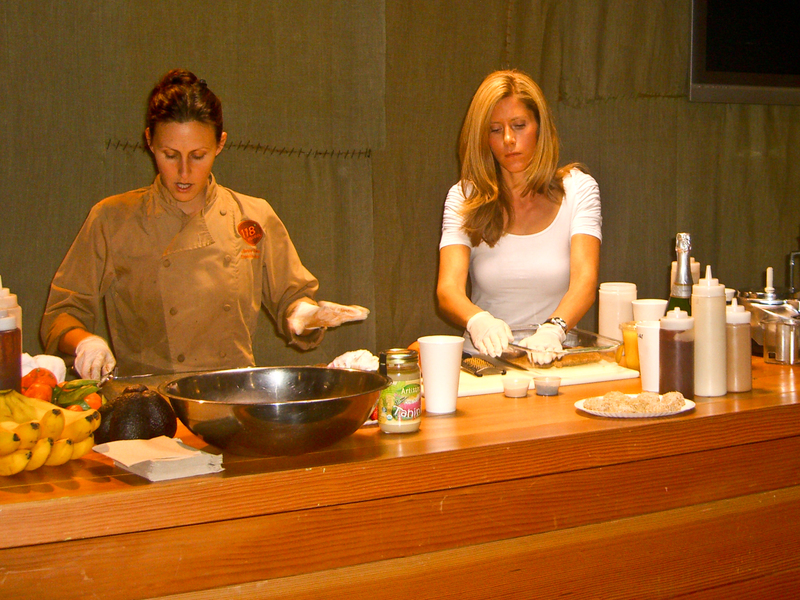 This was my first official raw foods cooking class. I have a few raw foods dessert cookbooks (Ani Phyo’s and Kristen Suzanne’s) that I cook from, but nothing can quite compare to a class where there is interaction and discussion. 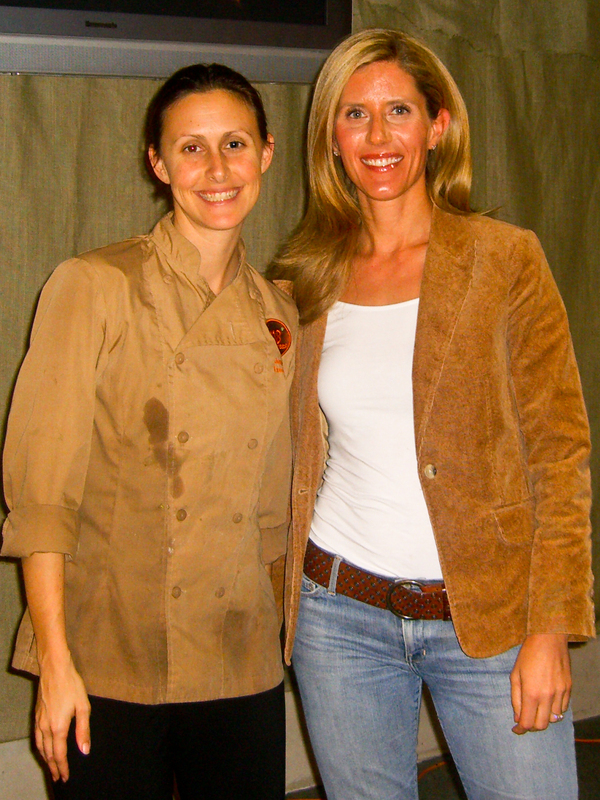 I loved being able to bounce questions and ideas off of the creator and chef of 118˚, Jenny Ross. All of the ladies in the class (there were 8 of us) were really interesting. 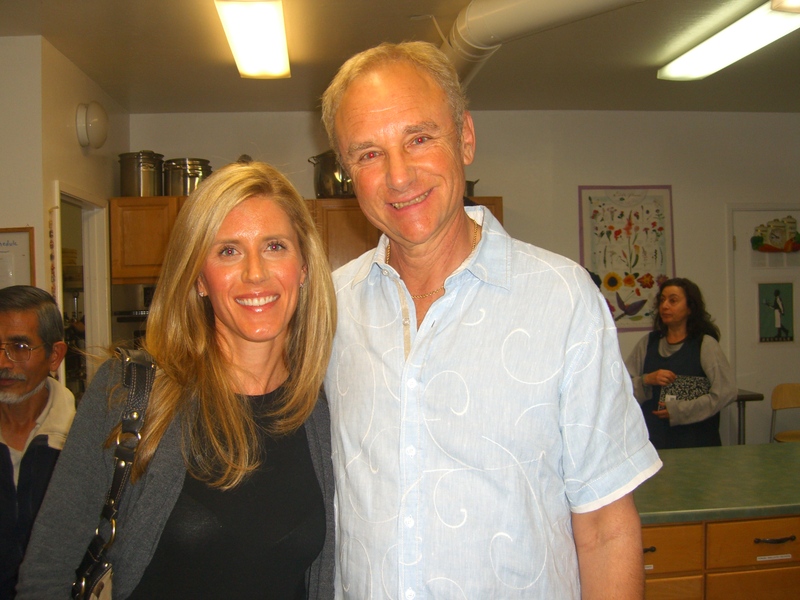 Among us there were vegan chefs, a nurse practitioner, a woman who is a two time cancer survivor and has made the switch to vegan/raw in an effort to remain healthy, myself, and others interested in learning more about raw vegan food. We all met at the restaurant which is located in the shopping center called The Camp and then made the short walk over to the Seed Market where the actual class took place which is right above Patagonia. 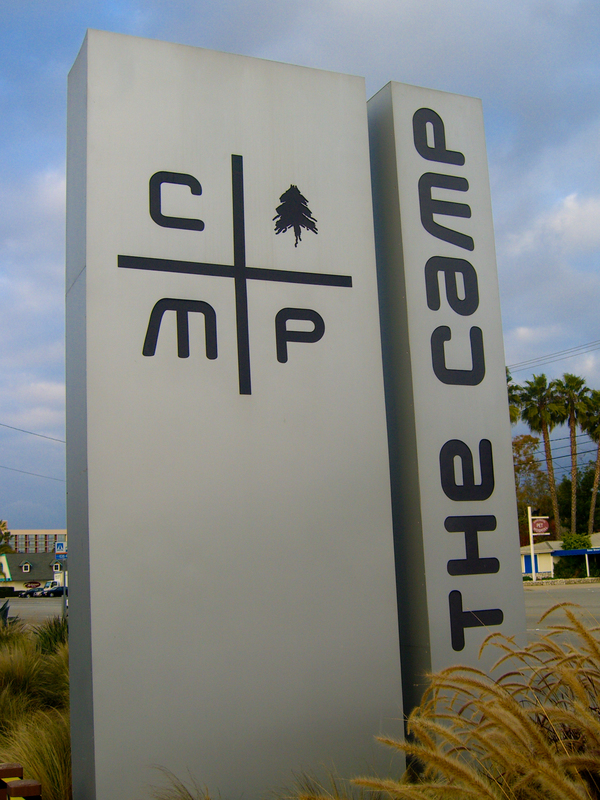 I have never been to this area of Costa Mesa and really look forward to going back to explore…it has a Sant Cruz kind of vibe. The class began by making three different dessert sauces; caramel, coconut cream, and chocolate sauce. Chef Jenny made the sauces and then put them into squeeze bottles that she bought at Sur La Table (she said they sell BPA free squeeze bottles). That is such a great way to store the sauces and it makes them easy to use on their own, i.e. with fruit or to squeeze right into the dessert recipes she uses the sauces in. Next we moved onto dessert crusts and made a walnut based crust and a pecan based crust (that we later embellished to make raw brownies). Below you see me making the walnut crust with Chef Jenny. After making the crusts we moved on to making apple cobbler, avocado orange bars, chocolate brownies with chocolate fudge, macaroons, halvah with apples, drunken fruit, and fruit fondue. By the end of class we all had a lot of desserts to take home. When I got home my kids decimated the brownies…so good! All in all it was a lot of fun and VERY educational. I learned so much more from her about how to use my Excalibur dehydrator more effectively and different twists on making raw pie crusts, etc. I can’t wait to whip up some more raw desserts…I am sure the kids won’t object.